A team of survivalists is stuck in an underground bunker. Together they try to find a cure for the virus that turned the entire population into zombies. Day of the Dead: Bloodline is directed by Hèctor Hernández Vicens and was released on Jan 5th, 2018. 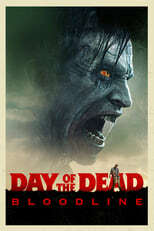 Director Hèctor Hernández Vicens's Action & Horror movie Day of the Dead: Bloodline is produced by Nu Boyana Film Studios & was released 2018-01-04.